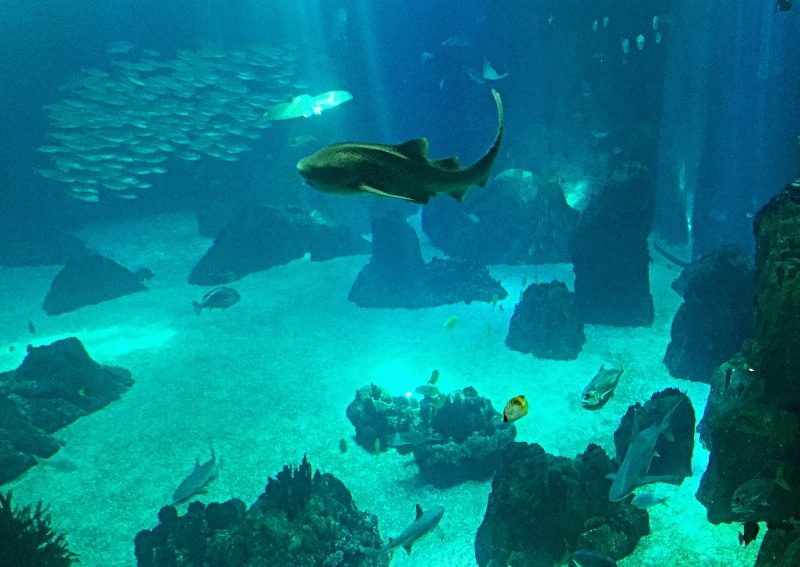 Behind huge panes of thick glass so clean that there seems to be nothing between you and the fish, a shark glides silently by. In the background, a shoal of small fish twists and turns as though connected by invisible bands. 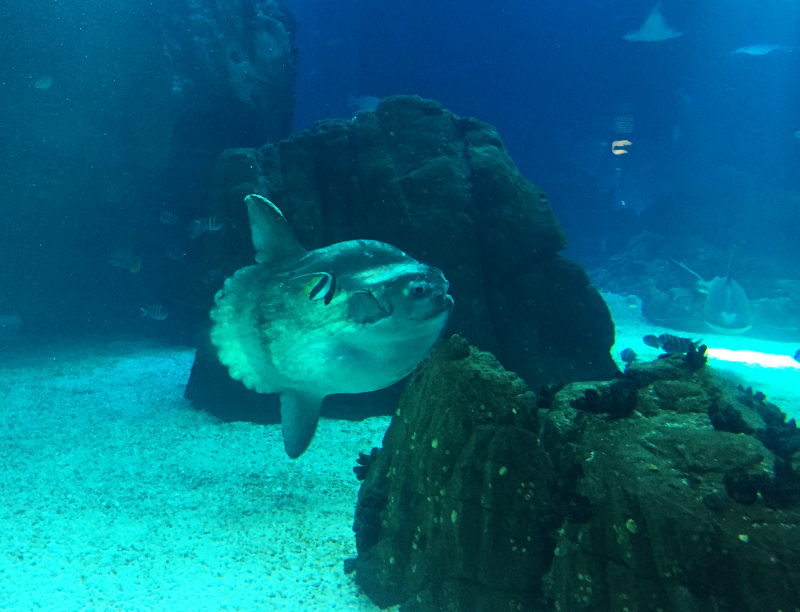 Is that a sun fish - strangely in Portuguese it is known by the diametrically opposite name, a moon fish - in the background? Will it come this way? Should we go round and try to see it through another window? I find I can't tear myself away from the scene. It's like watching a David Attenborough film much closer up than ever before. Indeed it is a sun fish. What was nature thinking about when it provided a fish with such a stumpy, deckle-edged tail and those fins so far back on the body? It's so weird that I find myself chasing round the windows to catch up with its crazy shape. Eventually I tear myself away from the sun or moon fish as a ray sweeps elegantly by. The most leisurely flap of its 'wings' moves it by at surprising speed. Its aerodynamic - or should that be aquadynamic? – shape is both beautiful and efficient. I could watch the fish in this huge tank all day. There is such a variety: little coloured fish, zebra striped ones, large sharks, bottom hugging fish and those that like to pop their snouts above the surface. The main tank isn't all there is to see though. Squaring the circle made by the main tank are corners representing the oceans of the world and their special ecologies as well as smaller tanks displaying special features of certain species. Let's look at some of them. 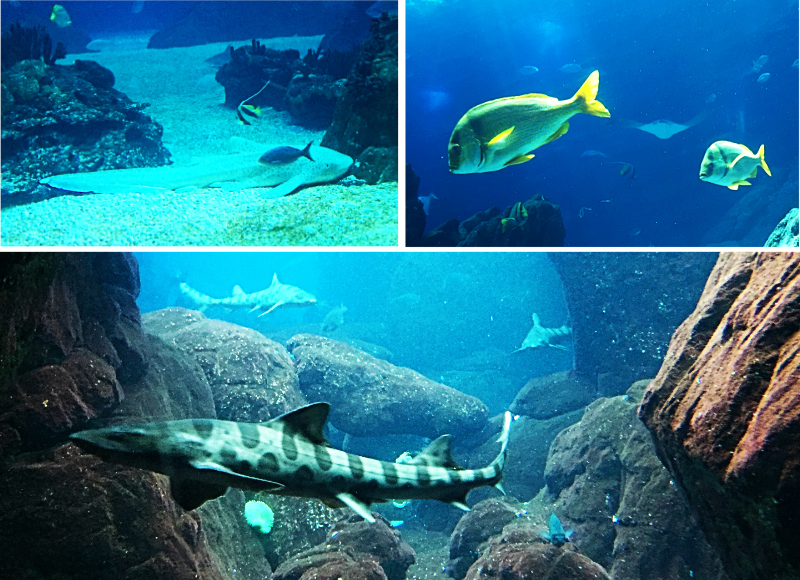 How about tropical reefs in the southern oceans? 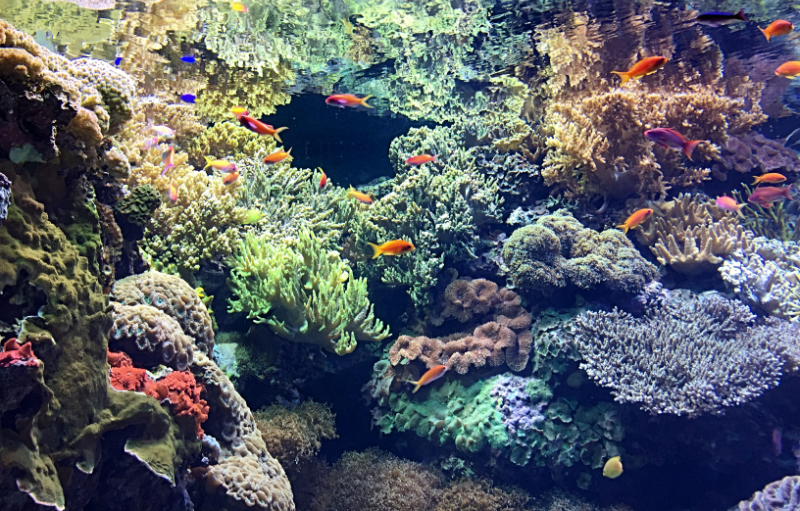 Look at the shapes and hues of the corals and the brilliant colours of the fish, especially the tiny electric blue ones on the left. 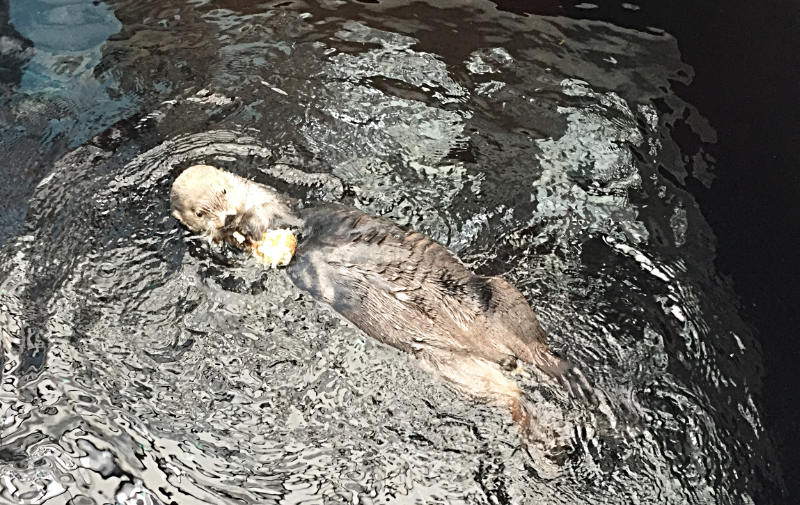 In cooler waters there are otters cuddling and chewing on their crabs. They twist and roll and play but their most charming position is lying on their backs in the water as though emulating sunbathers by the seaside. 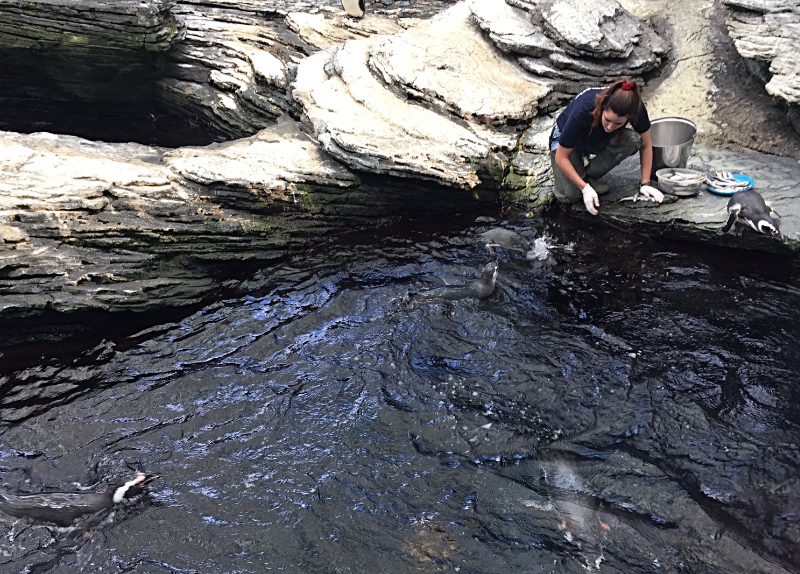 Even colder Antarctic waters support penguins and if you are lucky you might catch them amongst the bare rocks and ice being fed with fish by a keeper. 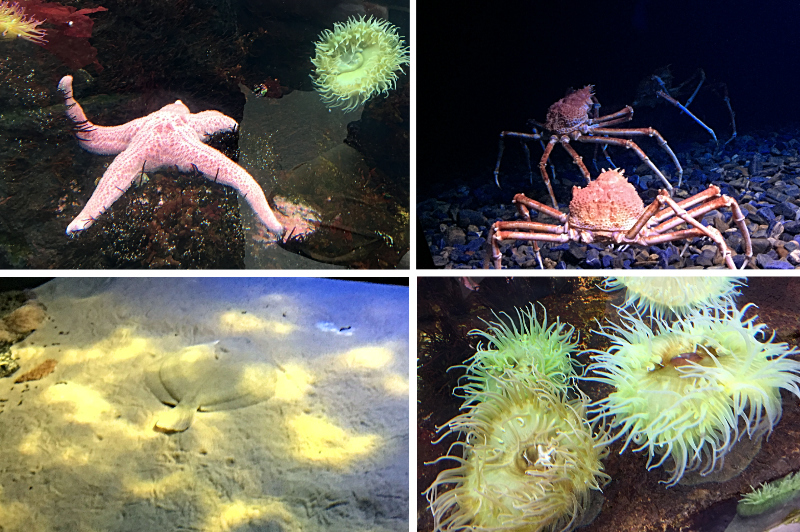 Small tanks show details: star fish, long legged crabs, flounders hiding in the sand and sea anemones amongst many others. 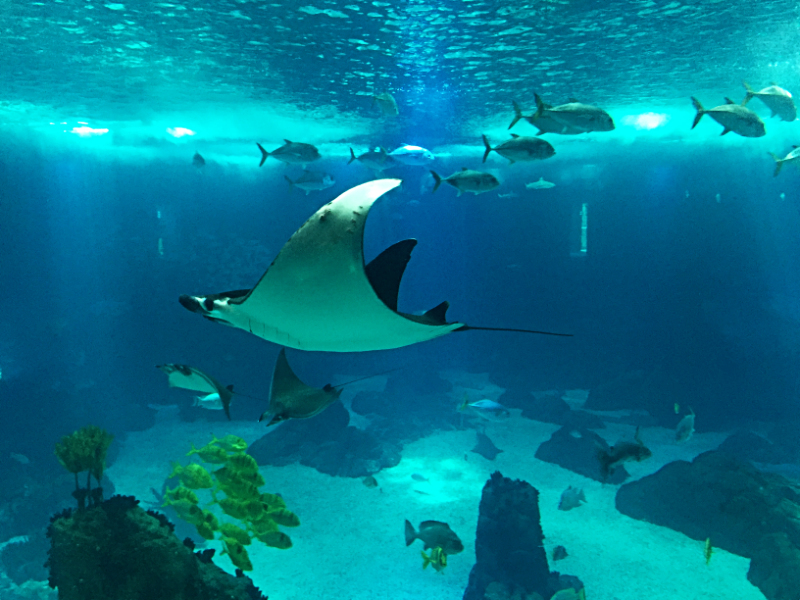 You can read the names of the fish, crustaceans and mammals, wonder at their habits and learn of any history connected with them in both Portuguese and English. 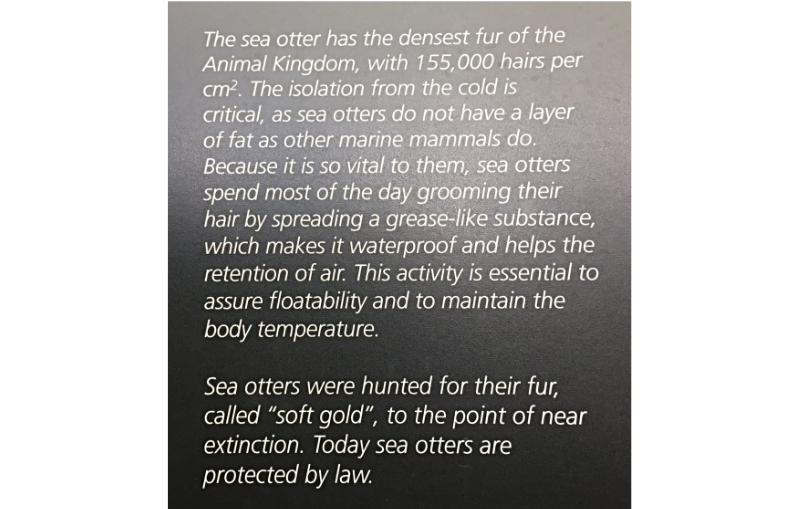 Here is an example of information about the sea otter. 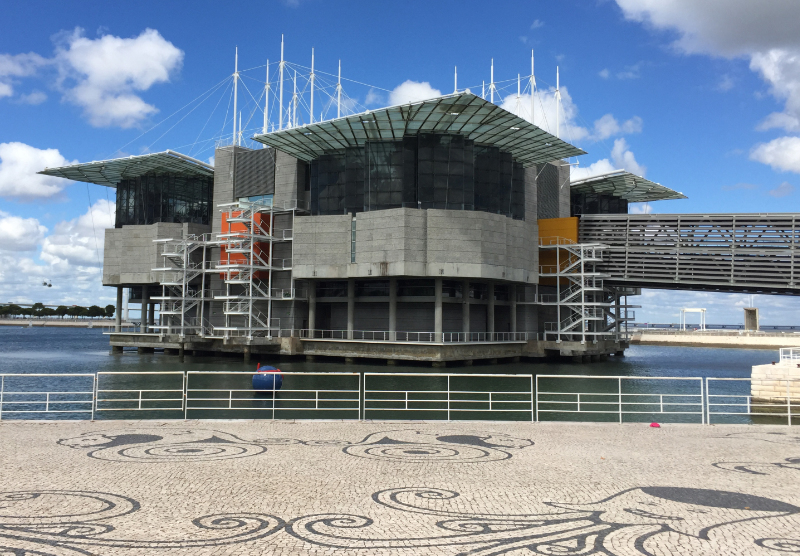 I hope you have enjoyed this cursory visit to Lisbon Oceanarium, where you can wander at leisure enjoying the vast variety of shapes and colours; discover the different areas of our blue, watery planet; absorb masses of information about a huge number of species; and learn how endangered much of the ocean environment is. It's a great day out for both children and adults. It is education at its very best, education as enjoyment, education as a form of play. I could have stayed hours longer than we were able to. Let me encourage you to put this water world on your list of 'must dos', on your 'bucket list' of places to visit.